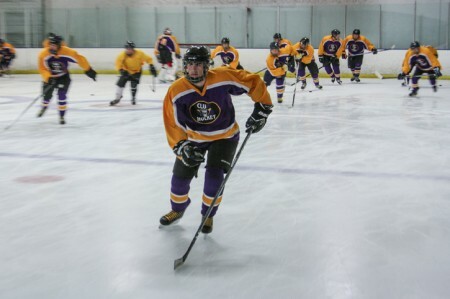 CLU Knights forward Paul Norick and teammates attend practice at the Iceoplex in Simi Valley. Ice rinks in Southern California used to be scarce and junior leagues almost nonexistent. The Los Angeles Kings came on the scene in the late ’60s, built an arena – and soon played home games for thousands of empty seats. As everyone knows, the turnaround came when Wayne Gretzky, “the Great One,” skated into LA in an extraordinary trade with the Edmonton Oilers in 1988. Suddenly, the Kings were the hottest ticket in town, at least the equal of a “Showtime” Lakers game. In fact, one year prior to that, international students from Norway formed a CLU club team that played its last game in 1992. Members of that very popular first squad also came from Finland, Canada, Minnesota and elsewhere, according to the former faculty adviser and coach. Now, ice hockey is back at Cal Lutheran with a new brand of club team. The Knights were founded five years ago by Spencer Votipka ’12, a current MBA student and former freestyle specialist on the Kingsmen swimming team. It’s turned out that Votipka, a Colorado native, and team captain Antonio Foreman, a local from Agoura Hills, have had most of their luck recruiting products of the Southern California junior ice hockey and roller hockey programs that were inspired in large part by Gretzky. There is now just one Norwegian on the 20-member team as well as one player who hails from the Northwest Territories of Canada. The Knights began more as a social and recreational club than a competitive one. Charter members would get together to learn the rules, watch games on television, and attend LA Kings and Anaheim Ducks games here and there. Club members also participated in open-rink “stick time” classes at the nearby Simi Valley Iceoplex where they could learn hockey skills. Fast-forward to the 2013-14 season, from October through February, and the team was drawing crowds of more than 100 to home games at the Iceoplex and racking up a winning record. The highlight of the season came in February, when the CLU Knights traveled to take on the Notre Dame University club team (not the powerhouse Division I team) at the Compton Family Center, a 5,200-seat state-of-the-art facility built in 2011. The Knights suffered two losses in South Bend, Ind., but they had an unforgettable trip and also lined up a contest against Notre Dame in Simi Valley for next October, Foreman said. “Hockey’s been my passion since I was 6 and the Colorado Avalanche won the Stanley Cup,” said Votipka, who added that when he arrived at CLU he was surprised at how little students knew about the sport. “A lot of them didn’t even know that a Southern California team (the Ducks) had won the Stanley Cup just the year before,” he said. Once Votipka, a defenseman, was able to assemble enough players to field a team, the Knights joined a “non-check” league at the Iceoplex. As their level of play improved, the Knights last year joined the Pacific Coast Hockey Association, playing “full-check” games against college hockey clubs including UC Santa Barbara, UC San Diego, San Jose State and Chapman College. Zach Margeson, son of the ice hockey coach at nearby Oaks Christian High School, was brought on as coach and guided the team to a 9-4-1 record in 2012-13. The Knights defeated the more established Chapman squad 8-5 that day, but the victory was only part of the transformation. Club members recruited classmates and friends, and when practice began last fall, the roster had doubled to 20 players. That is a remarkable achievement considering that the Knights are not part of the CLU Athletic Department and that money for the Iceoplex rental, travel, equipment, referees and other expenses comes out of the players’ pockets. The Knights also receive funding from the CLU Student Senate. Getting the word out about the Knights, Foreman said, has been the biggest challenge. To that end, he’s created a club website, www.CLUHockey.com, and a Facebook page, and is toying with the idea of producing video webcasts. After graduation in May, Foreman said he would love coming back as an assistant coach. He’d also love seeing ice hockey become a collegiate sport at CLU, but realizes that it is unlikely given the small number of college ice hockey teams in the West and the high travel costs that implies.